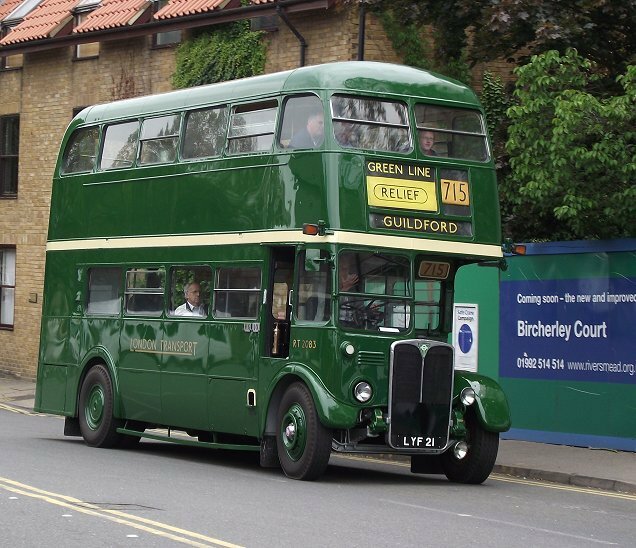 Do you like GREEN London Transport buses? Do you enjoy days out in the Country? Do you remember glorious days on Green Rovers? Answer yes to any of these and Country Bus Rallies are for you. 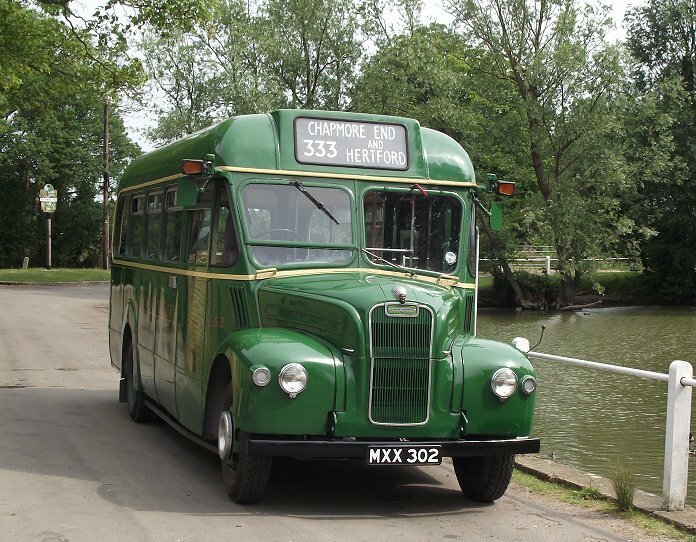 Whether you are a bus enthusiast, a fifties fanatic, a number collector, a photographer, or someone who just likes a good day out, Country Bus Rallies are the thing for you. They happen on a few Sundays a year, mostly during the warmer (if not drier) months. 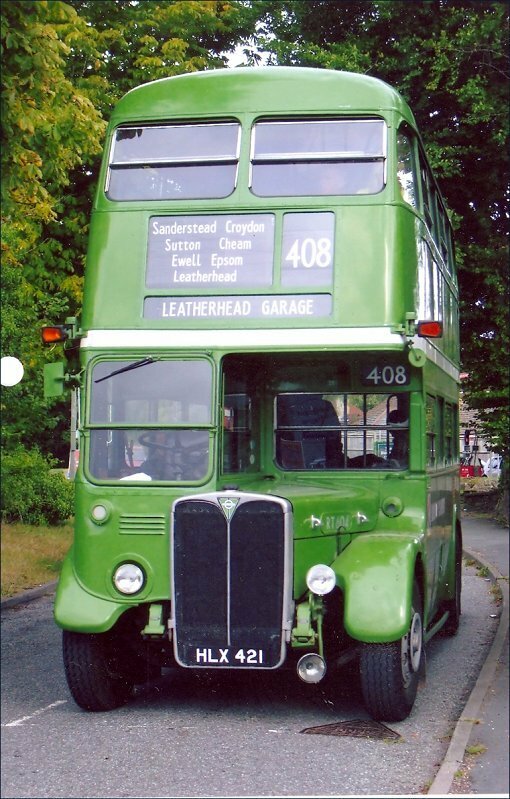 Preserved green London Transport buses, mainly from the fifties and sixties - and their drivers and conductors - plus a few red friends, gather together for a day running services around a market town somewhere in the London Country Area, places like East Grinstead, Hertford and Sevenoaks, plus an annual Summer Holiday event in Eastbourne. GS2 at the rural terminus at Chapmore End, in June 2011. There are proper published timetable for the days, that can be obtained in advance so that you can plan your excursions and make connections. There are enough buses for you to do this, with connecting points scattered around in towns and villages - and at pubs. We even try not to leave anyone behind at the end of the day! Sometimes events conspire to wreck the best of well-laid plans, like road closures, drivers getting lost, or even punctures. It all adds to the enjoyment if you come in the right frame of mind! Services at the major events are provided free of charge. Possession of a programme is not required, and does not constitute a ticket or a right to ride on services. Nevertheless we do hope that you will purchase a programme! 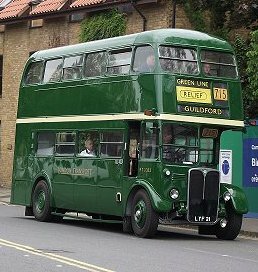 RF28 worked Green Line route 713 between Epsom and Dorking in September 2009. 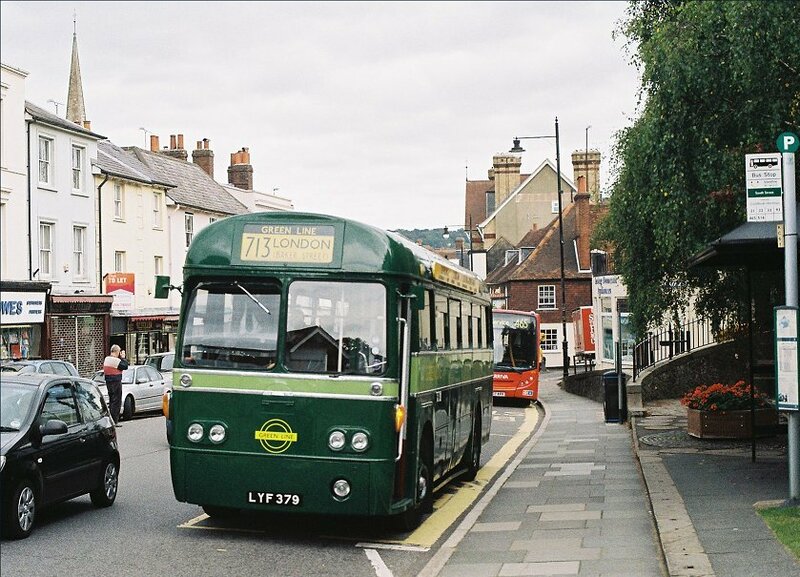 Here it is at the Dorking terminus. can be done in several ways: public transport from London is one, and there are often free feeder services from various places around London. (Details in programmes or from here a few days before each event). Feeder journeys can often be very interesting in themselves. 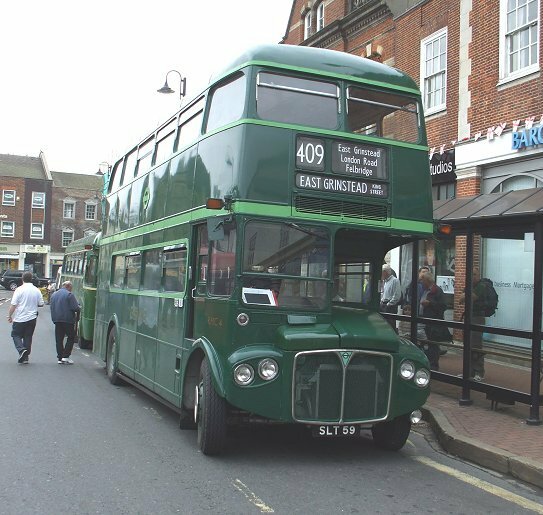 In April 2010 RMC4 worked to East Grinstead from Bromley using route 410 to Godstone and then 409 to East Grinstead, before working on routes 409 and 708 during the day. 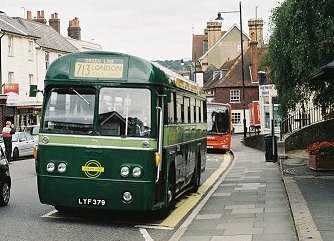 RT2083 at Hertford Bus Station, June 2011, running short journeys on the Green Line 715. Hertford Bus Station at Bircherley Green is still in he throes of rebuild. 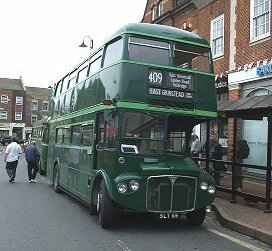 This year's Hertfordshire event will be based on Hitchin (St.Mary's Square), with routes radiating out, including Welwyn Garden City, Stevenage and some to Hertford (where we have the use of a couple of stops). 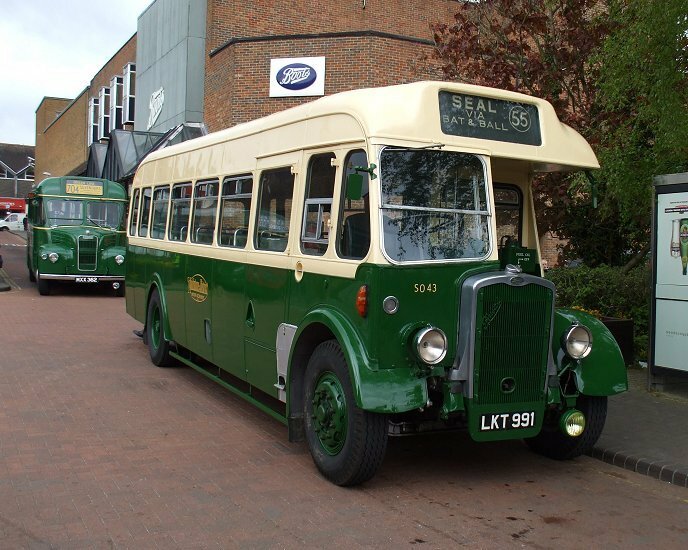 Country Bus Rallies also run single route or small area events using one or two vehicles. These are published in advance in the programme for larger events, and are notified to postal purchasers of programmes. Because of their small size they have to be booked in advance from the organisers. These are CLUB events for which a CLUB subscription is payable. Forthcoming events to be determined. Further plans are being developed, and you will get to know when they come to fruition. 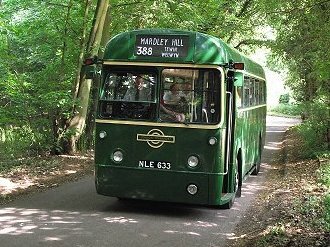 RF633 in the lane to Tewin on the 388 to Mardley Hill on Saturday 4th June 2011. Sat 6th June 2010: Route 351. 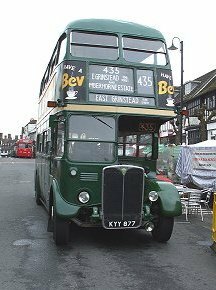 Sat 3rd June 2017: 303: New Barnet Stn - Hitchin - Stevenage. Please don't e-mail ian smith, as he doesn't have the lists. GS62 and RF308 meet at Tewin on the 388, June 2007. 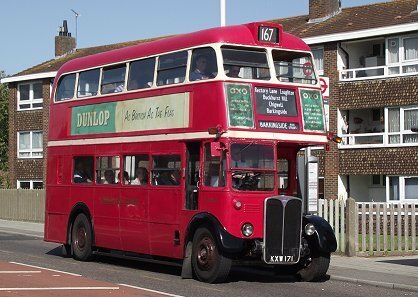 The theme for most events is London Transport 1950s and 1960s, so you can reasonably expect RTs, RFs and GSs (allowing for their aging condition and the difficulties of obtaining spares. An RLH or two have made appearances sometimes too. 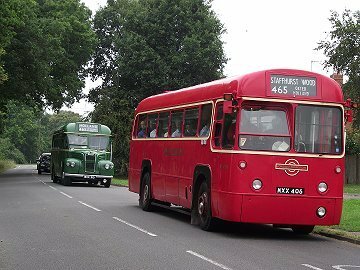 Most of the buses are green, but there are some red ones, a reminder that on Summer Sundays in the fifties the Country Area had to borrow heavily from the Central Area to keep up with demand. 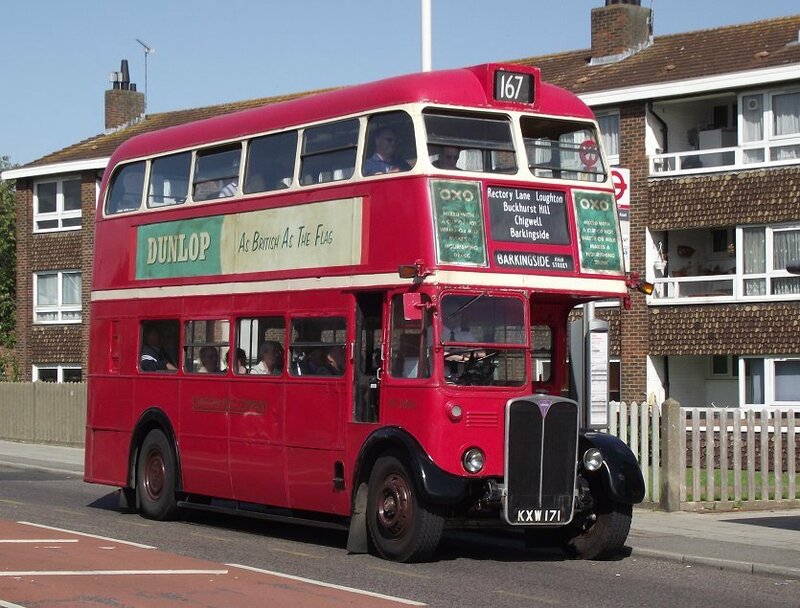 There is a growing more modern contingent too, with Routemasters, Leyland Nationals, AEC Reliances, and even more modern buses now that the disabled persons regulations have made many still-young buses redundant. 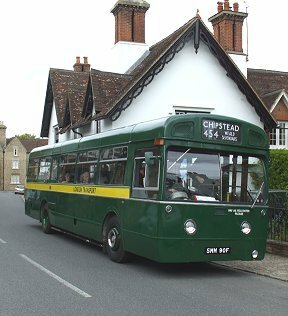 As the Country Area abutted other operators there may also be some planned routes using preserved buses of Maidstone & District, Southdown, United Counties...as appropriate. Have a look at 2005's Gravesend report. 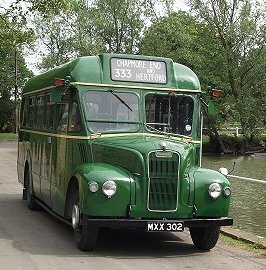 Maidstone & District Bristol SO43 operated at the Sevenoaks Running Day in May 2010. Where can I buy a programme / timetable? Programmes for each event can be obtained for about a month in advance of each event. They include the expected allocation/running sheet. Programmes can also be purchased on the day, but buying one in advance will help you plan your day (and is �0.50 cheaper!). Possession of a programme is not required to use the services. Some journeys that we expect to be heavily in demand will require a free control ticket to be obtained from the control point before boarding. MB90 pauses in Chipstead with a 454 working from Tonbridge, May 2010.
Who organises it? What should I know? 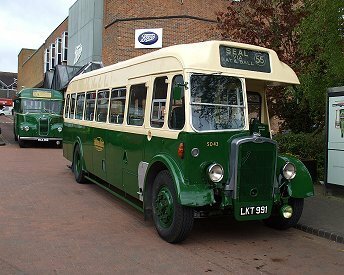 Country Bus Rallies are a group of volunteers, who have come together to offer these events. They have a wealth of experience in bus preservation, and enjoy sharing their hobby with the public through these running days. It is NOT a business! The group has no obligation to provide the services, to operate in accordance with the published timetable, or to provide particular buses - but do try! 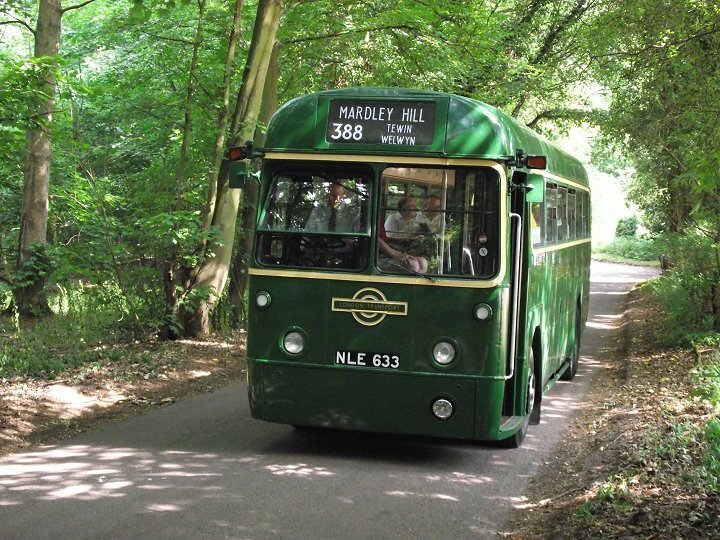 The buses are mostly provided by private preservationists. Some have private vehicle insurance, some are public service vehicles. Please respect the vehicles, which are elderly and cared for in their owners' spare time. Enjoy your day, and help others to enjoy theirs. RT604 worked on the 408 between West Croydon and Effingham or Guildford in September 2009, while RT3148 worked on the local 435 at the East Grinstead Day, April 2010. What about the Central Area? Operating in Greater London (Central Area) is more difficult. The main problem is not Transport for London, who are very co-operative with responsible groups, but the problem of finding places to stand or park buses. Bus stations are often not useable in the TfL zone as these are in intensive use seven days a week. So CBR operations in red areas usually involve small numbers of buses which operate without using a central location. 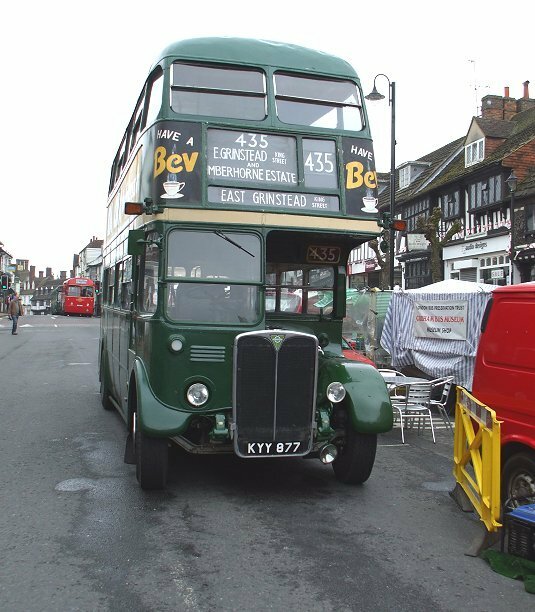 For these reason the Bromley mini-Running Days have operated without a programme or published timetable, and the days at Loughton have had few buses to avoid parking problems and allow use of Loughton bus station. Text and photos by Ian Smith. Click on photos for a larger picture. Ian Smith and Ian's Bus Stop have no official connection with Country Bus Rallies, although I have enjoyed riding and recording some of the events in the last few years, and am regarded as group photographer for the events I can get to. Information is provided in good faith, but I have no responsibility for organising or providing facilities. The reports are purely my personal record of the days, and not an official record, so the emphasis is purely mine and not that of the CBR organisers. Some aspects of the days get overlooked by me, or left until next time, so apologies to anyone who expects comprehensive coverage of all aspects! 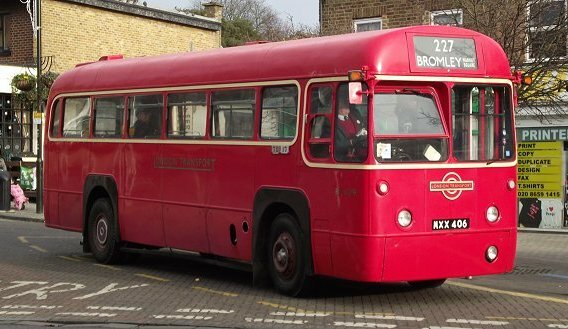 As was common in the 1950s, red buses feature on the Country Bus Running Days. Here RF429 duplicates GS15 on a 465 journey to Staffhurst Wood, passing Holland (September 2011). OTHER ORGANISERS also have London-orientated running days and rallies. Country Bus Rallies have no responsibility for any aspect of their organisation or content. Amersham & District are organising a number of events, but because when I mentioned them here people applied to us for programmes instead of to the organisers you will have to look them up for yourselves.